A tiny eastside taco shop in Las Vegas. You would never find this place, in a million years, and if you drove past it, you wouldn't consider stopping in for a torta. This is the kind of sandwich in the kind of restaurant someone has to tell you about, and that's what happened. And now I'm telling (writing) you about it, and you're going to go try it. 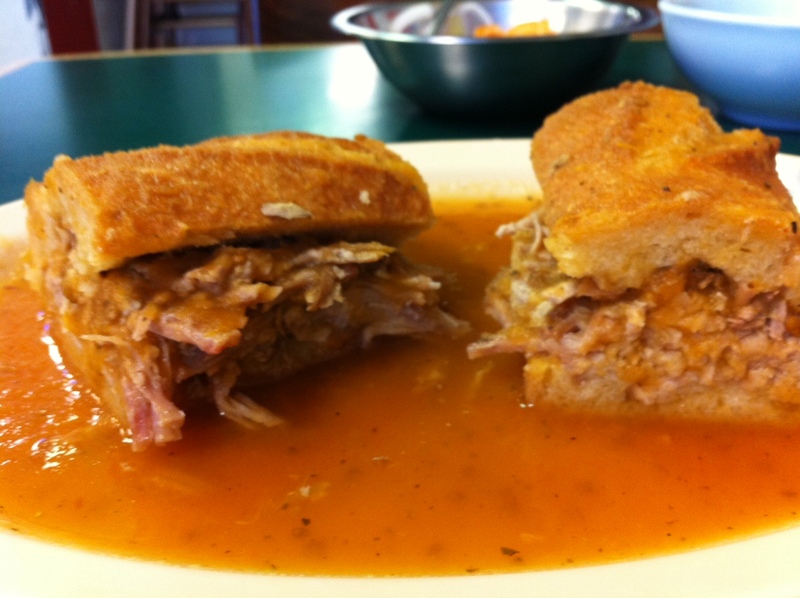 For simplification, let's call this the Guadalajaran version of the French dip, only with pork, and WAY BETTER. The roll is dense and crusty. The meat, piled on top of a thin layer of refried, mashed beans, is carnita-syle pork, roasted to succulent perfection. And there's quite a bit of it. That glossy orange sauce it's swimming in? Drenched in? Totally saturated in, so that the sponge-like roll is absorbing every drop of that sweet-and-earthy spiced tomato salsa? It's fantastic. What you can't see is in that silver bowl in the back: spicy chile de arbol, another smooth salsa rich and thick and hot as hell, with raw white onion shards hanging out. For fun. You need to pile that stuff on each bite of porky wonder to get the full effect. That's what this sandwich should be called: The Full Effect.